Our final week aboard The Waterman- our 1925 Dutch barge… so much better (note my nose in the air) than those newer, plastic boats- has been somewhat a shock. After three weeks of pastoral bliss, we have left rural France where excitement was counted in the total of locks navigated and number of cygnets herded by parental swans. We delighted in the stately swans, each a regal prima donna, all gliding by with unseen books balanced on their heads. The cygnets, their down so feather light, looked like floating dust bunnies. 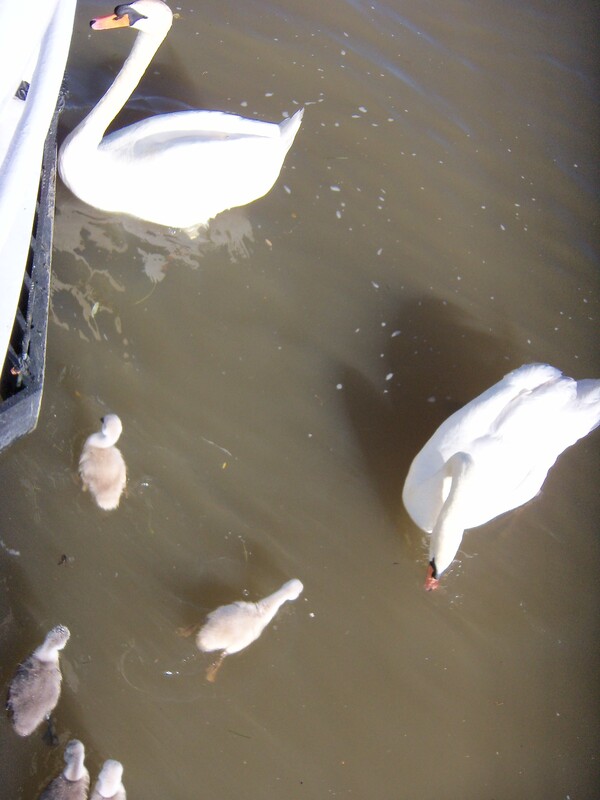 Two adult swans led the way, and six cygnets followed in their wake. A second cluster of five cygnets followed the first. Two more adults brought up the rear. We wondered if the four adults were related. Might the two females be sisters or cousins? Perhaps one male married his best friend’s sister? All we knew for sure was that if we had drawn too close to the babies, these serene swans would not have hesitated to peck our eyes out. 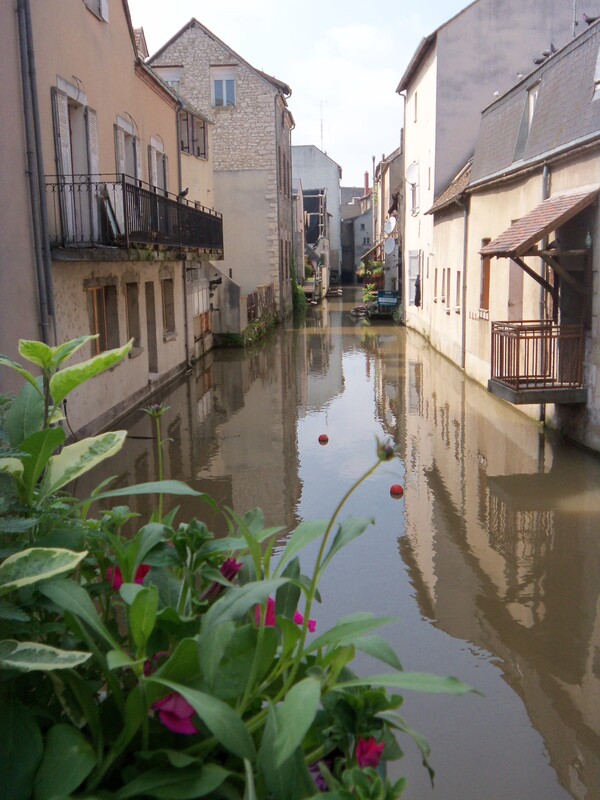 We loved Montargis (the last of the picturesque canal towns) with its Venice-like network of small canals. Montargis is large enough to find anything you would want; small enough to have a distinct identity. 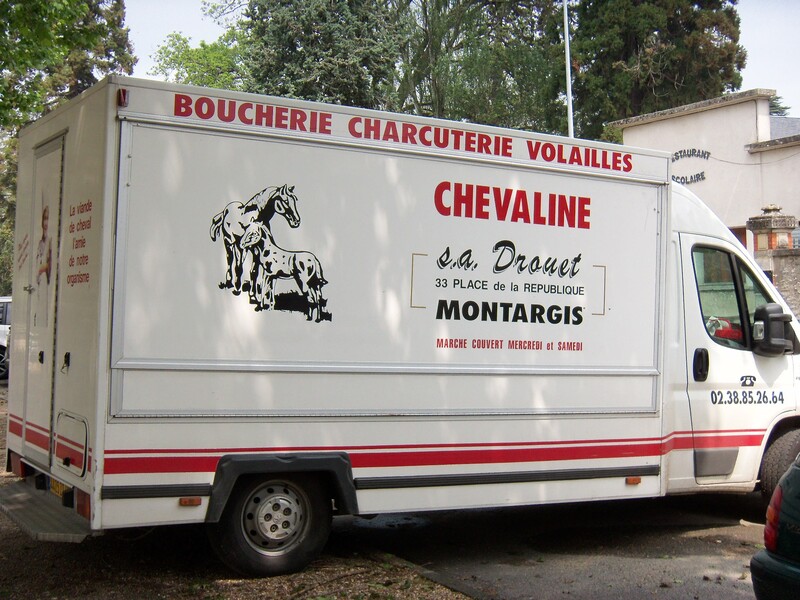 Walking the canals we saw a delivery van proclaiming the advantages of horse meat. 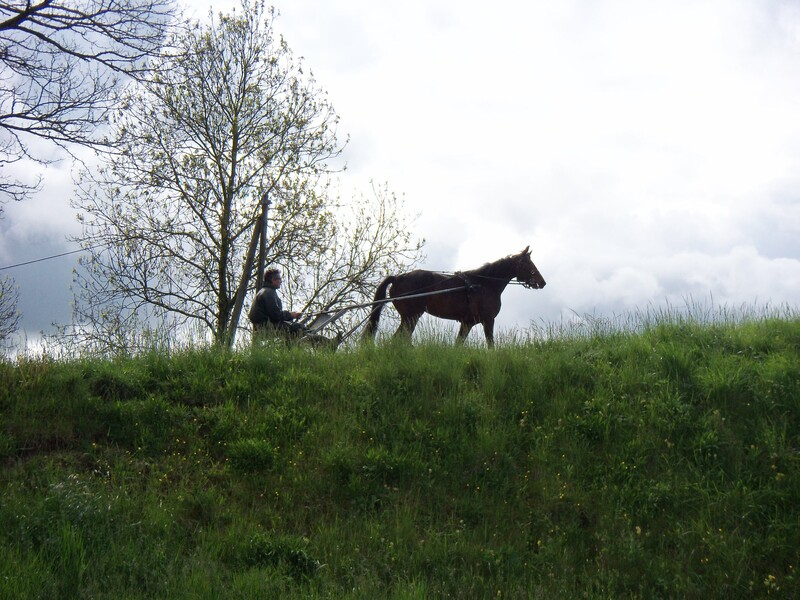 Yes, horse meat is lean, but I would rather not eat it. Horse meat is just not part of my culture. Along this same train of cultural thought… the windows of Eglise Ste-Madeline are beautiful beyond compare. But one window in particular caught my attention. The window celebrates the introduction of Christianity to the Far East. As I reflected on this particular window. I dropped to my knees on a Prie Dieu. 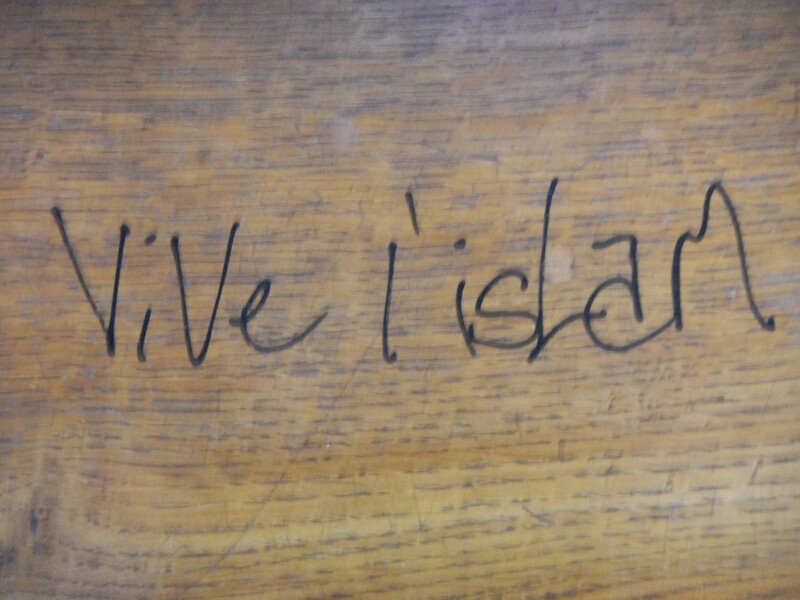 Looking down on the armrest, I saw that someone had carved ‘Vive l’islam’ on the surface. East and West – will the twain never meet? Our tribalism and cultural biases are primal. I don’t hold out much hope. 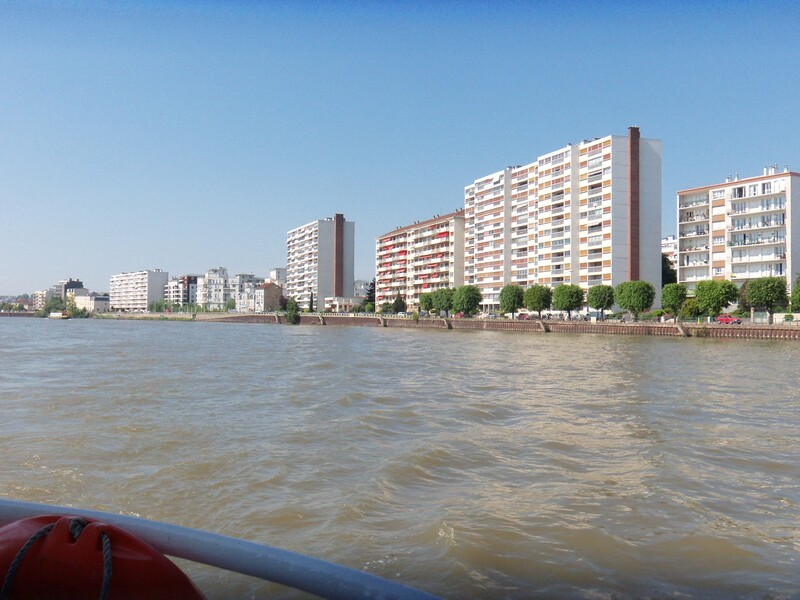 We left the canal and joined the busier more turbulent River Seine at Nemours, and as the landscape became more commercial and suburban, my dissatisfaction mounted. I am such a Romantic! You might think that I would prefer to leave the 21st century and become a 17th century goose girl. Gone are the century-old, stone houses and self-contained villages within a golden landscape. Gone are the narrow two-lane country roads with grass growing in the cracked asphalt. The pace has picked up. Cars crowd and billboards blighten the highways. Paris is a magnet and like iron filings, we are drawn to the city at ever faster speed. The houses fronting the river are more contemporary: a high-rise here, a bungalow there, and every so often a white, window-walled, California cube. The houses fronting the Seine are an international mix and without nationality. They leave me feeling bereft. This entry was posted in Uncategorized and tagged Eglise Ste-Madeline, Montargis, The Seine River. Bookmark the permalink. Will you sew a dress with tiers of downy feathers? Feathers… the name escapes me, but are you thinking of something like the Icelandic singer? I think her name starts with “B.” Sewing… I’ve got an endless list of chores. Still haven’t delivered on a warm window application and still haven’t sewn my Beckwith Ranch period costume. Why is it that the hour glass is still the same dimension, but the sand is running faster? Oh no, nothing modern. I’m thinking of the goose girl story. She tended the geese and gathered the feathers that flew off when they flapped their wings. Then she sewed them onto and into a dress that every little nature girl would envy. I don’t know (have forgotten) the goose girl story. I love fairy tales – I should read them all again. Bjork is the name of the Icelandic singer who shocked the world with her swan dress. Mark is a Bjork fan. I have requested that he listen to her when I’m not in the house.